I was originally planning to make this over the holidays when the family was here but, again, I had too much food preparation planned. In a large sauce pan, combine the tomato juice, sauce, wine, Italian seasoning, salt, pepper and cooked pork sausage. Heat to a simmer and let simmer 10 minutes. While sauce is simmering, combine ricotta, eggs, basil and oregano. Stir until smooth. 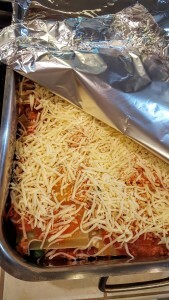 In a 12 x 16 inch roasting pan with deep sides, place a thin layer of meat sauce mixture (about 1 1/2 c.) and spread across the bottom of the pan. 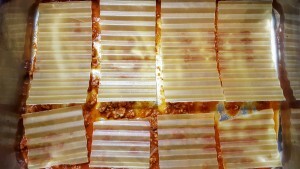 Cover with the uncooked pasta. Pieces should not overlap or touch side of pan. If needed, you can break the pieces in half, cross-wise. Spread about 1 1/2 c. of the ricotta mixture on top of the noodles. Layer the Canadian bacon on next. Top with a thin layer of sauce and about 1 cup of Italian cheese blend. Repeat this process with a layer of noodles, sauce, ricotta, pepperoni and cheese. Finally, repeat layer process with the mushrooms and spinach together. 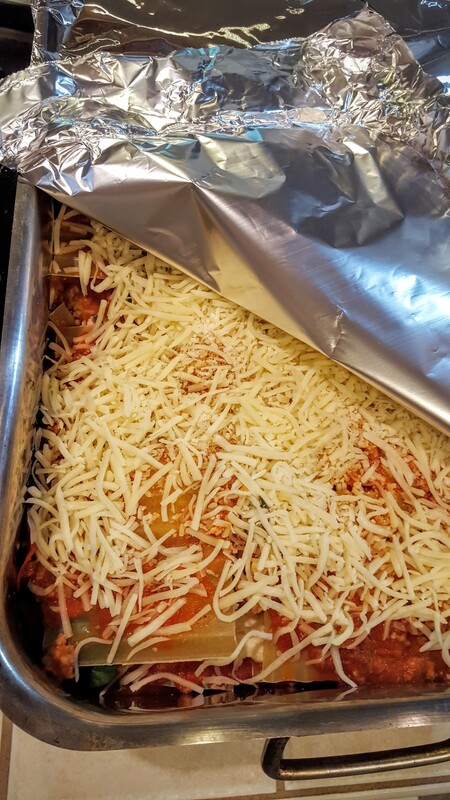 Your final top layer should be noodles, sauce and cheese. Remove foil and bake 10-15 minutes more or until hot and bubbly. Remove from oven and let stand for 5-7 minutes before cutting into serving sizes. Extra portions can be placed in sealable containers and frozen. *I used home canned tomato sauce. You can substitute about 2 (28 oz.) cans of tomato sauce OR pureed San Marzano tomatoes, knowing that your lasagna just might be a bit saucier. The only thing I would do different next time is to add a bit more spinach to the top layer. Yes, I would love more spinach too! It looks super comforting and delicious! I would love to make a lasagna with only spinach and mushrooms! But, I don’t know if I could get that passed The Hubs. Looks delicious! I love lasagne. What I need is a recipe that only makes 2 to 4 modest servings! This looks delicious! We have a specific Pinterest Board on Yum Goggle called Cooking for a Crowd that this would be perfect for! Around all the U.S. Holidays many people have crowds visiting and need to cook large amounts for them – this is one of those meals………..in fact, we are having family come this summer and we are going to make this for sure! I will try to get this submitted as soon as I am able, Kelli. Hope you like this! I must say, that is one hefty pan of Lasagna. I LOVE the addtion of spinach! I’m intrigued my the addition of the tomato juice. I don’t think I’ve ever seen that before but now that you mention it, why not! The notion that it freezes well is a definite plus! I use the juice to make the sauce a bit saucier, if you will. I thinner sauce works the best with the oven ready noodles I have found. Wow does that look good! 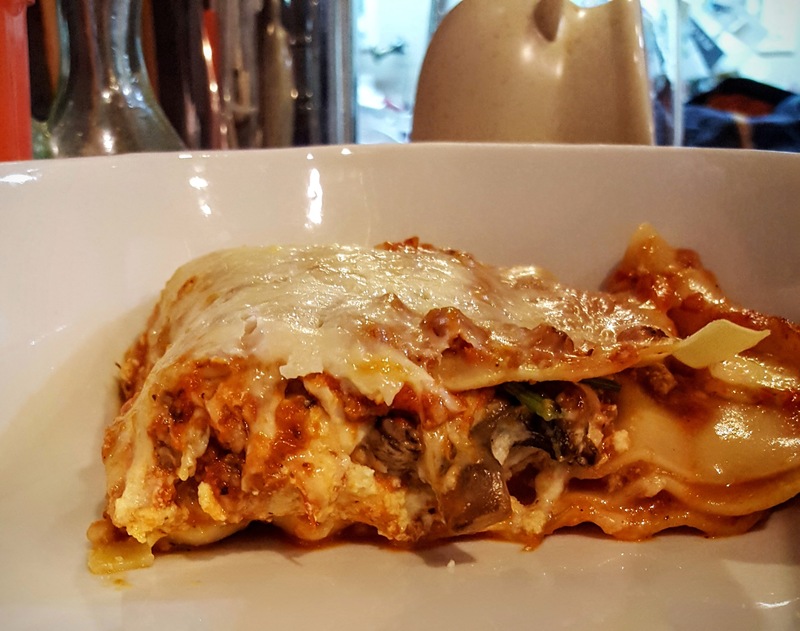 I only recently heard about oven ready lasagna noodles and I must try them out! 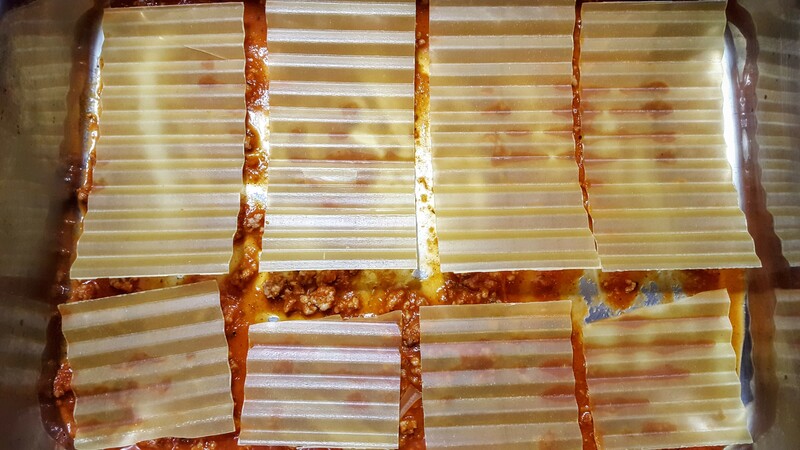 The noodles are one reason I don’t make lasagna – I always burn my fingers!!! I would never make it any other way, Mimi. 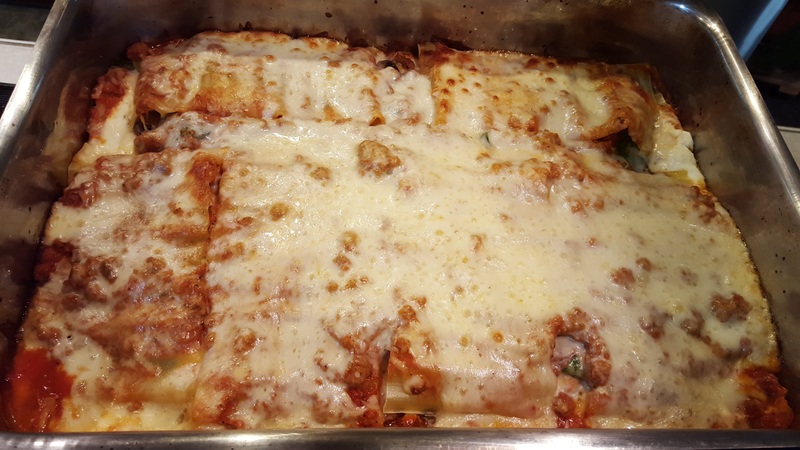 What a fabulous lasagna! My guys would love the variety of meats! And I love the spinach. Always nice to have homemade lasagna in the freezer for a busy day. That;s an awesome looking lasagna! I usually let others make it for me, but I might have to make this one myself. You certainly give it praise worth investigating.